The Windtales property is amazing-A private home converted into a perfect hideaway. This place is almost a secret, just knowing about it feels like a privilege! The location, atop a hill in Ano Siros makes for a beautiful adventure every time you step out of the door. Couldn't be a better way to experience Syros and furthermore, Greece. Windtales is in close proximity to great restaurants and tavernas via a great walking path (follow the white stones). The room was fantastic, as a matter of fact, the room inspired me to try and replicate the feeling in NYC. Very nice attention to detail, from the bed linens to the decorations. All done tastefully. The bathroom was next level! The service and the amenities is where Windtales really stands out- There is wine from the owners small family farm on the island. Breakfast every morning is light and delicious accompanied by handmade jams from again, the owners family farm. The best part is you get to enjoy it all on the terrace over looking all of Ano Siros. The owner Alexis, and his staff are all very kind and professional. Staying at Windtales feels like you're staying in an old friends private guest house. Comfortable, relaxing, and very beautiful. Sometimes you don't need much time to appreciate a place or a person! This is what happened with Wind Tales and Alexis (the owner) ! We arrived to this amazing small guesthouse to realise that this was the "escape" that we needed! Alexis was there to give us all the important information needed . And even if we know Syros really well, his tips were more than usefull. Our room (The Rock) OMG.... no further comments have to be added... the absolute relaxing ambience.... the breakfast, homemade and served with attention and love! What more can I say...?? It is like everything there is "covered" with stadust! We decided to spend some days every year at Wind Tales... enjoying the positive energy of this great place and people! Alexis is the perfect host. He welcomed us warmly into his beautiful guesthouse and our stay was magical from beginning to end. We were picked up from the port (for free) and shown to our fantastic room despite us arriving a little before check-in time. The rooms are magical and Alexis' attention to detail is what really makes the stay special. From the comfortable pillows to the fresh flowers daily, the rooms have everything you need. The whole guesthouse is stylishly decorated with a relaxing and romantic atmosphere. Breakfast on the terrace was undoubtedly the highlight of the stay. The view over Ermoupoli from the terrace is breath taking and all the fruits come fresh from Alexis' Dad's farm. It was definitely the best breakfast we had during our whole 3 week stay around the Cyclades. The breakfast staff were fantastic, really friendly and helpful. We also thoroughly enjoyed Alexis' cocktails on an evening and the terrace was equally as beautiful and peaceful on an evening. We were also pleased with the location as it is up the hill, away from the main town but only a 4 euro taxi journey in or 12 euros to the beaches. Wind Tales is a unique little gem, which is hidden away among the twisting streets of Ano Syros. It is a place of tranquility, luxury and indulgence and we definitely recommend it to anyone visiting Syros. We thoroughly enjoyed our three nights spent at Wind Tales earlier this month. This is a unique and intimate guest house in a stunning location. As others have mentioned, the owner Alexis is extremely attentive and was there to meet us at the ferry port (very helpful as the house is almost impossible to find in the car-free maze of Ano Syros). Alexis gave us useful advice about the town of Ermopouli and the rest of the island and was happy to make arrangements for car rental etc. Breakfast was outstanding and included home-made jams, marmalade and other treats from the farm of Alexis' family in the north of Syros. We also enjoyed little treats such as limoncello and wine that were left in our fridge. My wife and I are still in awe over our 4 night stay at Wind Tales with Alexis and his assistant, Madelina. Alexis was unbelievably warm and helpful from our arrival on the ferry until our departure. Thank God he met us and brought us to his wonderful hotel in Ano Syra since we would never have found Wind Tales on our own. It is tucked high on the hill and in the midst of the narrow walking streets within the ancient city. Our room was delightful with a wonderful terrace overlooking Hermoupolis and the Aegean. Madelina served us an outstanding breakfast each morning featuring jams made fresh by Alexis's mother. Alexis was extremely helpful in offering suggestions on how best to enjoy our stay on Syros. He hunted up a doctor when I developed the need for one and went well out of his way finding items that we needed to purchase in Hermoupolis. We simply can not say enough about how wonderfully we were treated. Five stars does not say enough. We stayed for 2 nights in the Relax room, the bathroom was the highlight - Ancient Greece with modern comforts - we loved it, Alexis couldn't be more helpful, he offered countless suggestions and a extremely peaceful atmosphere - from our first encounter (a pick up from the Port), he called restaurants, taxi's, and even gifted us with his mothers homemade marmalade - he oozes kindness and sincerity, highly recommend a stay in this off the beaten track beauty. What a wonderful, inspiring location. The same must be said about the superior room with the panoramic view of half the Cyclades. Superbly laid out, it shows that the host, Alex, has clearly thought of every detail and has implemented it in the most elegant, traditional and environmentally friendly manner at the same time. Especially the bathroom is other-wordly. Alex was welcoming and eager to address every need. Especially, his suggestions on where to eat were all spot on. His staff were also excellent. The breakfast was superb. A mix of modern and traditional. Almost all home-made. For example, the jam was made by Alex's mother. Room Tip: The superior room has spectacular views, and they bring your breakfast to your veranda. We had a fantastic time at Wind Tales ! First of all, the facility is perfect, our room was stunning, bathroom was huge and decorated with taste. Every morning, we had breakfast with an amazing view on Syros and the sea. Wind tales is a really relaxing place, a bubble ! Last but not least, Alexis the owner and his staff were amazing. Very efficient, suggesting the best places to have dinner, to go the beach. He made reservations for us for dinners, for windsurf and diving lessons etc... Actually you get the service of a five stars hotel in a family atmosphere. We can't wait to go back ! Many thanks to Alexis and Antonella. I loved Wind Tales. It's perched high in a historic medieval town with beautiful views of the bay. We enjoyed the beautiful terrace where you can have breakfast or a cocktail in the afternoon. The lobby and the rooms are charming, cozy and super clean. The owner, Alex, is so friendly and happy to help with directions, activities, restaurants, etc. They source a lot of local foods and press their own fresh juices. Ask Alex about his homemade wine! I have hesitated to write a review because I would like Wind Tales to be a secret, or at least exclusive! What it offers is special in every way. We spent 6 nights in August 2015, and Alexis ensured that we had a perfect holiday. Cordiality and warmth balanced with privacy, the stunning views and generous breakfasts, and just the delight of it, conjure up the most wonderful memories. We will return. This was our second trip to Syros island. We had the chance to stay in both “The Rock” and “The Flight” room and they were beyond our expectations. They emitted warmth and tranquility with a distinctive and pleasant scent of lavender filling the air. The rooms were very clean, cozy, elegantly decorated and equipped with everything one needs to make his/her vacation comfortable. The Flight room provides a private balcony from which the view is unique. But every room has a common space with the same view. There, is the place where the breakfast is also served. Oh! The breakfast; our favorite time of the day! It included delicious home-made marmalades, fresh yogurt and other local goods. If you eat cold cuts then you MUST try looza. Ask Alexis about it! Alexis made us feel like home, he was always willing to keep us satisfied and provide us information on anything considering the island. The days we spent in Wind Tales will surely be unforgettable! While I was on holiday in Syros I booked a one night stay at Wind Tales bed and breakfast as a surprise for my husband birthday. We stayed in the rock room which was very different and very different experience. Alexis the owner could not have been nicer and played along when he collected us from the port with the surprise. The view from up there is just wow. Breakfast the following morning was served on the terrace and was wonderful , everything fresh,homemade jams honey etc. We would certainly stay again. A wonderful B&B with only three rooms to choose from. Only one has a private terrace (Flight) but you don't need one to enjoy the magnificent view that opens up from the huge shared terrace. You can enjoy your breakfast or evening cocktails on the terrace (or watch sunrise or the moon rising... we saw the rare red full moon!). There isn't really anything to do the in Ano Syros apart from walking up and down the stairs and visiting the Catholic church and the tiny museum of Markos Vamvakaris, but who needs activities when you can simply take in the view. Don't just run around the island, but take time to relax n Ano Syros abd the Wind Tales (a taxi to Ermoupolis takes 5 minutes and costs 5 €). The place is absolutely amazing! It has the most wonderful view of the island! The whole house is a gem, very well decorated as well as the rooms! We were lucky enough to stay in both "Relax" and "Rock" rooms, each one unique on its own way! The breakfast served in the terrace is home made and delicious and the view is breath taking! The host, Alexis is very kind, helpful and took really good care of us..as well as Flora :) We strongly recommend Wind tales and we would definetly come back next time we visit Syros! Discover the little details that makes this place dreamy!!! I visited Windtales in September with my companion. We had an amazing time! The owner Alexis and the rest of the staff are friendly, accommodating, professional and will give you all the information you would like to know when visiting a place for the first time. The breakfast (consisting of traditional, local greek delicacies) is served on the balcony viewing Ermoupolis and the sea. The view is exceptional during the day but also at nighttime. What drove me to write this review is the attention to detail paid in the design, maintenance and service to customers. I would absolutely stay again there! We spent three (all too brief) nights here in September, mid-way through our month in the Cyclades, and we can honestly say that this is the most unique accommodation we have ever stayed in. After exchanging emails, we were met at the port by Alexis and Dimitri, who made us feel very welcome immediately, before we were driven up (and up and up!) to Ano Syros. Alexis is a mine of information and didn’t stop talking and pointing things out on the way up; and on arrival in the parking area, our bags were transported speedily through the twisting, tiny streets to our room by Dimitri. Ano Syros is a delightful maze of alleyways and steps, and (unless you have the recollective powers of a superhuman) you will lose your way at least a couple of times. It is a case of remembering the small landmarks: “Turn left at the statue, go down the steps, walk on until the door sign with the yacht…..go up the steps” etc. There are some tavernas and a few cafes, bars and shops, but it’s a very quiet and peaceful generally; and from up here you feel like you are in a different place altogether, on top of the world and cut off blissfully from reality. After being shown our room, we were given a brief talk by Alexis and given a map. It was important to pay heed here, as his tips and recommendations were proved to be very accurate and true; however, it was very difficult to concentrate when confronted with the amazing view from the terrace. Many reviewers have commented on the “Rock” room and we share their opinions - it is incredible. The room was decorated with perfect taste, and all of the fixtures and fittings complemented the room perfectly with just the correct degree of “quirkiness”. Much thought has obviously gone into the small details. We liked the travel trunk table in particular, and the enormous “helicopter blade” ceiling fan that looks like it will be noisy and cause a hurricane in the room, but in fact is totally silent and very effective. There are numerous options with the lighting, such as the small lamp in an alcove which adds yet more romance to this fabulous room. Small touches, such as bunches of lavender on the bed, and a beautiful rose left in a glass for our return one day added to this feeling. The bed on the rock looked like it may be a bit uncomfortable from the pictures we had seen on the website, but I can say that this is not the case. There is a triple-layer of mattress and it is supremely comfortable, and there are plenty of pillows (some are coco-mat) and high-quality bed linen, so you can arrange it to your personal preference. All of this meant we slept, if you forgive the pun, like a rock. The rock continues on into the bathroom, and gives you the impression that you are having a shower in a cave – a luxury cave with good bath products and high-quality towels. You are given a separate key which gives access to the beautiful lounge area, where there are many interesting books in different languages to choose from; and this room leads to the spectacular terrace, where breakfast is served - and what a breakfast: Coffee, delicious bread, yogurt with honey and muesli, boiled eggs, a very tasty home-cured ham, tomatoes with feta, grapes and home-made orange and fig marmalades and a home-made fruit juice of our choice And all served at what is a very civilised time for “night owls”, and this certainly set us up for the day. Whilst there was no direct view from our room, it was so easy to just walk through the door to the front of the property, or through the lounge to the terrace and be presented with a fabulous view of Ermoupoli below, with the port and the very blue Aegean and the islands beyond seeming to float in the air. Yes, it is a communal terrace, but so what? It is huge, and there will only be a maximum of a few others others sharing it with you, although we only saw one other person on it during our stay. Not that it was a problem for us at all, as we are sociable animals. At night, it is incredibly romantic as the lights of the town come on down below, and the stars become visible overhead. You could easily sit here all day and night, watching the ferries come and go and contemplating the meaning of life; but then you would miss out on the delights of the town…. By day, you can wander around Ermoupoli (it’s a nice stroll down from Ano Syros) admiring the handsome neo-classical buildings – many of which have been restored and others which are distressed and crumbling somewhat, giving great character to the place (memories of past glories and all that); or maybe have a look inside the Apollon theatre which is modelled on La Scala opera house or the impressive town hall in the huge main square, visit the numerous churches with their priceless treasures and icons; or have lunch or a drink at a harbourside cafe after a swim off of one of the platforms (the view from here is gorgeous) in the beautiful area of Vaporia, which they call “Little Venice”. At night, like so many places in this wonderful country, the city “comes alive” and there more than enough shops, bars and restaurants to keep you occupied. We found the standard of these places to be high, and the prices to be more than reasonable. If you are lucky, you can witness a performance at the theatre, or a movie in the open-air cinema, however, we have saved some of these treats for return visits – we are sure there will be many! You could easily spend a week in Ermoupoli and not get bored - it is interesting and lively and it will surprise you. Everyone we met was friendly and helpful, and all seemed to be proud of their island and its capital; and so they should be – it is a truly marvellous place and a perfect contrast to the other Cycladic isles. It is not at all “touristy” although we found the level of information provided to visitors to be excellent. We had heard that Ermoupoli suffers from a problem with graffiti defacing the public buildings – if this was the case before, then it certainly is not true now, as we saw very little of this during our exploration. We fell in love with this place as soon as we saw the fantastic vista from our ferry as it approached the island, and departed feeling the same way, but also very sad to leave. We cannot recommend the accommodation and the surrounding areas highly enough. Wind Tales is a perfect place to stay in the tranquillity of Ano Syros with the hustle and bustle of Ermoupoli below, and it was worth every penny. Thank you Alexis and your staff. Breathtaking! This place is amazing and we highly recommend Wind Tales to anyone visiting Syros. The room was beautiful, clean and I've never slept on such a comfortable bed with the best linen. The host was awesome, gave us all the information we needed and he is really friendly and helpful. The breakfast was delicious and made from local ingredients. The owner really goes out of his way to make you feel at home and enjoy Syros. 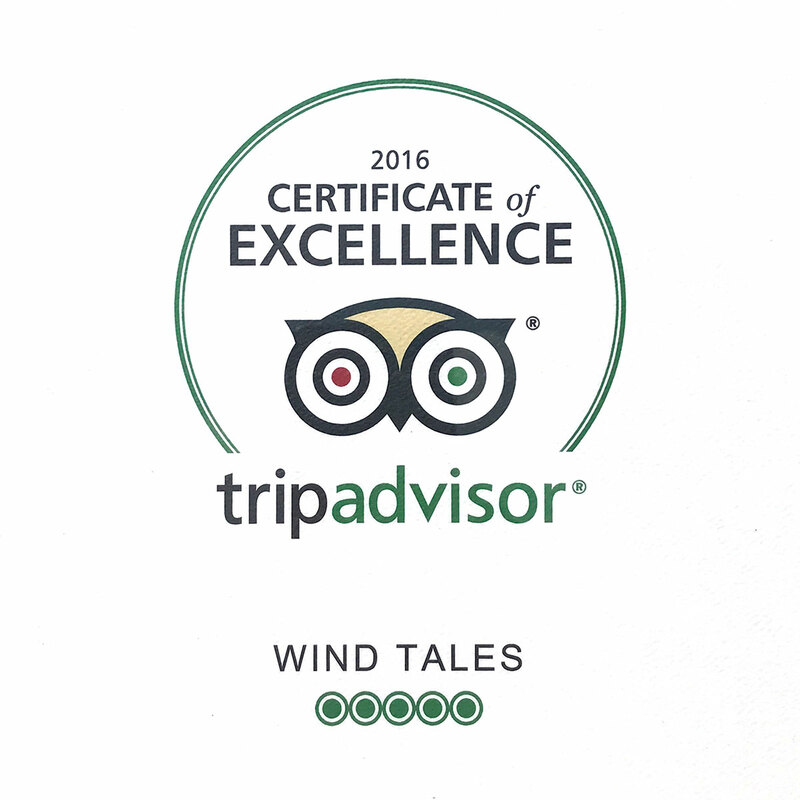 We are really glad we found wind tales and will definitely be back. In the room we got local wine and liqueur as well as all the toiletries we needed. Wish I could give this a 11 out of 10. My husband and I had the great fortune of finding Wind Tales, at the end of our week long sailing charter in the Cyclades. We took a ferry over to Syros for 2 nights at Alex's hotel. We were met by 2 of his friends who were waiting for us at the ferry, they were warm and welcoming and after car transport, walked us up the winding streets to WindTales, which sits pirched on the top of Ano Syros and is reached only by small walking streets. The rooms are built into the rock of the mountain, are stunningly beautiful and naturally designed for a cool breeze and a lovely view of the sunrise on your personal veranda overlooking the port. The staff was more than gracious, friendly, and kind, even delivering us to the airport in time for our flight back to Athens. The room, veranda, shower and common space were emaculate and beautiful with thoughtful touches for our comfort. The breakfast was by far the best bed and breakfast fare I have had, including homemade grape juice from their vinyard, tomato juice from their garden and figs from their trees. We also sipped wine from their vinyard on our veranda as we unwound from the day. We did take full advantage of Alex's other business, his windsurfing camp, with excellent equipment and very economical rates on a little hideaway of a beach. 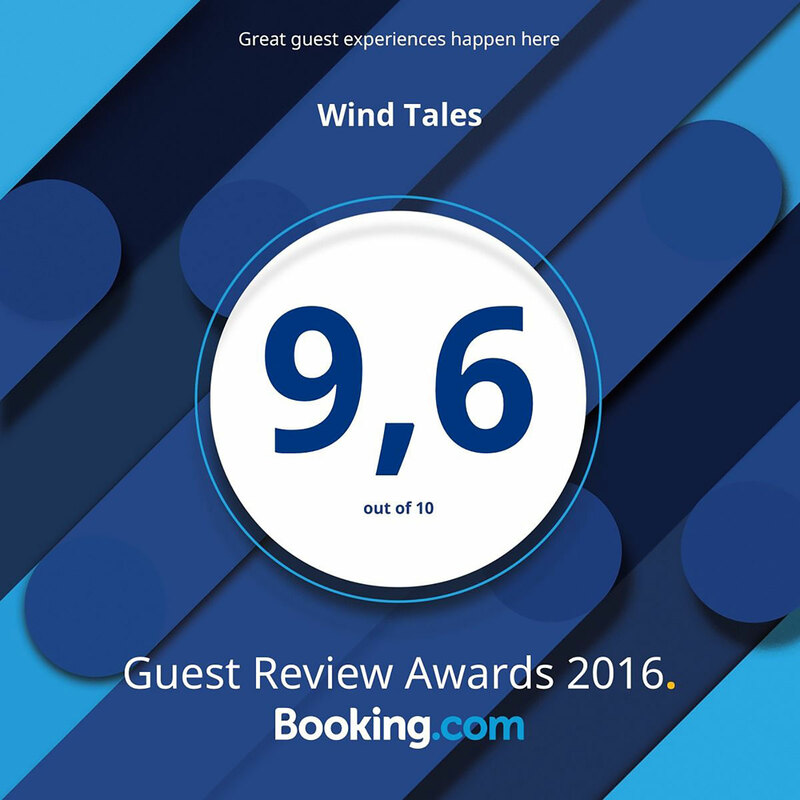 We couldn't think of a better way to end a trip to Greece, and have decided that Wind Tales will be the first reservation we make if we every get back here, and plane tickets will be the second reservation. Thank you to all the support staff and ownership of this very well maintained, toughtful and one of a kind lodging. Είχαμε την τύχη να φιλοξενηθούμε σε ένα από τα υπέροχα δωμάτια του Wind Tales. Από την πρώτη στιγμή της άφιξής μας, ο Αλέξης και οι συνεργάτες του μας έκαναν να αισθανθούμε σαν φίλοι τους. Η μοναδική θέα από τη βεράντα μας καθώς και το υπέροχο δωμάτιο, μας έκαναν να θέλουμε να αφήσουμε στην άκρη την περιήγησή μας στην όμορφη Σύρο και να μείνουμε εκεί, καθ όλη τη διάρκεια των διακοπών μας! Το δωμάτιό μας ήταν πανέμορφο, πεντακάθαρο και παντού υπήρχαν μυρωδιές από λεβάντα και φρέσκα λουλούδια. Το πρωί απολαύσαμε, ένα χειροποίητο και πεντανόστιμο πρωινό!! Με λίγα λόγια;;; Μετράω αντίστροφα μέχρι να ξαναπάω!!! στο πιο γραφικό σημείο του νησιού!πεντακαθαρος χώρος και ευγενέστατο προσωπικό ,σε έκαναν να νιώθεις σαν στο σπίτι σου ! Πολύ καλό σπιτικό πρωινό σε συνδυασμό με φοβερή θέα που σε κάνει να ταξιδεύεις..
Ο Αλέξης ,ο ιδιοκτητης,εξυπηρετικοτατος πρόθυμος να σε βοηθήσει κ να σου δώσει πληροφορίες σε ότι χρειαστείς . Το δωμάτιο καλαίσθητο ,φωτεινό με πολύ καλό άνετο κρεβάτι κ φανταστικό μπάνιο . ολα ήταν τέλεια! !συνεχιστε έτσι !! Η διαμονή θα μείνει αξέχαστη. Η τοποθεσία των δωματίων είναι στο καλύτερο σημείο της Σύρου με απίστευτη θέα στον κόλπο της Ερμούπολής που κόβει την ανάσα. Εξαιρετική και επαγγελματική εξυπηρέτηση. Δωμάτια απόλυτα καθαρά και συνεχώς τακτοποιημένα. Πρωινό με παραδοσιακά χειροποίητα προϊόντα (σπιτικές μαρμελάδες, λεμονάδα και χυμός σταφύλι!!!!! !, φρέσκοι χυμοί) απολαμβάνοντας την απίστευτη θέα. Διακόσμηση που σπάνια βρίσκει κανείς επιμελημένη με γούστο και μεράκι. Οι απόλυτες συνθήκες για να ξεκουραστεί και να ξεφύγει κανείς από την καθημερινότητα. H λέξη "μοναδικό" αποδίδει επαρκώς αυτό το κατάλυμα! Προφανώς αυτό το διαμέρισμα δεν σχεδιάστηκε-υλοποιήθηκε για ενοικίαση.Αυτό συνέβη εκ των υστέρων. Καταπληκτική εσωτερική σχεδίαση και διακόσμηση με εξαιρετικά art crafts. Η Αντονέλλα και ο Αλέξης νοιώθεις ότι σε τιμούν με την παρουσία τους. Εξαιρετικό service-καθαριότητα-πρωϊνό,περιποίηση σαν χάδι. Ιδιαίτερες πινελιές με αρώματα και χρώματα λεβάντας και θυμαριού και γεύσεις(πρωϊνό) που σου φέρνουν θύμισες από άλλες εποχές.Η θέα μαγευτική και η ησυχία του μέρους σε βοηθά να χαλαρώσεις.Προτείνουμε για το απόγευμα κοκτέιλ που φτιάχνει ο Αλέξης στην αυλή συνοδεία ιδιαίτερης μουσικής. Θέλουμε πολύ να επαναλάβουμε την εμπειρία! Εξαιρετικό ξενοδοχειο value for money προσφερει ολα οσα αναφερει... πρωινο χορταστικο διαφορετικο με τοπικα προιοντα ακρως γευστικα, ο ιδιοκτητης πολυ φιλικος και εξυπηρετικος μας ειπε τα παντα για το νησι προτεινε δραστηριοτητες και γενικα οτι χρειαστήκαμε ηταν παντα εκει ! Ο ξενωνας ηταν σε μια μαγευτικη τοποθεσια με υπεροχη θεα δωματια ιδιατερα που δεν θα τα συναντησεις αλλου παραδοσιακα ναι μεν αλλα με ολες τις συγχρονες παροχες και ο υπνος απλα απολαυστικος σε ενα τετοιο μερος με ομορφα πουγκια με μυρωδικα κρυμμένα στα μαξιλαρια που σε χαλαρωνουν... οι καλυτερες διακοπες απλα!!! Εξαιρετική τοποθεσία με την καλύτερη θέα στην Σύρο. Πεντακάθαρα δωμάτια με γούστο και ανέσεις για καλό ύπνο. Ο Αλέξης πάντα εξυπηρετικός, παρείχε τις καλύτερες πληροφορίες για όλο το νησί: φαγητό, παραλίες, αξιοθέατα, ντόπια προιοντα. Οι συνεργάτες του πάντα ευγενικοί. Από τα καλύτερα πρωινά σε ξενοδοχείο με σπιτικά υλικά. Πανέμορφος ξενώνας στην 'Ανω Σύρο, μειναμε πολύ ευχαριστημενοι από το δωμάτιο, τις ανέσεις και την εξυπηρέτηση. Τα δωμάτια έχουν καταπληκτική θέα προς το λιμάνι, αξίζει το πρωινό ξύπνημα να δειτε την ανατολή του ήλιου! ΚΩΣΤΑΣ - ΑΘΗΝΑ: Ηταν ένα υπέροχο τριήμερο σε έναν εξαιρετικό ξενώνα. Το Wind tales είναι ένα σύγχρονο και συνάμα παραδοσιακό κατάλυμα που δένει αρμονικά με την μοναδική αρχιτεκτονική της Σύρου. Ο ξενώνας ξεχωρίζει για την καθαριότητα του, την αισθητική ιδιαιτερότητα του και γενικότερα για τις ανέσεις που προσφέρει. Είναι ιδανικός χώρος για χαλάρωση και ηρεμία. όσον αφορά τον Αλέξανδρο, ιδιοκτήτη του ξενοδοχείου, απλά άψογος σε ολα του. Εγινε φίλος μας. Και μια λεπτομέρεια. Το Wifi λειτουργεί άψογα. Το Wind Tales το συστήνουμε ανεπιφύλακτα. Πανέμορφος ξενώνας στο πιο ωραίο σημείο της Σύρου. Τοποθετημένος μέσα στο κάστρο και τα σοκάκια της Άνω Σύρου, έχει μαγευτική θέα και προσφέρει ησυχία και ηρεμία στην ιδιωτική του αυλή όπου απολαμβάνεις και το υπέροχο ντόπιο πρωινό σου με θέα όλο το νησί από ψηλά. Είναι προσεγμένος από το πιο σημαντικό μέχρι και την τελευταία λεπτομέρεια - δείγμα της κουλτούρας του ιδιοκτήτη του. Εξαιρετική η φροντίδα από το προσωπικό του ξενώνα - μέχρι και φρέσκα λουλούδια υπήρχαν κάθε πρωί στο δωμάτιο. Μείναμε στο δωμάτιο "relax" του οποίου το μπάνιο ήταν ανεπανάληπτο. Σίγουρα θα τα ξαναπούμε σύντομα! Staying in Wind Tales was perfect!! The whole guest house is placed in a beautiful hill, in medeval town, overlooking the city of Ermoupoli..with breath taking views.. We liked everything! Room was perfect, very spacious and stylish..Bathroom was big and specially designed with so many details to make one feel comfortable and pamppered! Breakfast is served at beautifully decorated veranda with sea view..and islands in the distance. Not to mention that we slept and ate like gods with homemade specialities! Special thanks to Alex, the owner and the girls Christiana and Maddalena who made us feel so welcome and made our stay even more special.. One of the most beautiful and special places we've been so far and definitely good value for money! Wind Tales is a unique hotel and run on a very family basis. Alexis' mother makes the jam. Alexis' father makes the wine. It is like staying in your home - if your own home were stunning, beautiful, well-staffed, caring, helpful, and on a most attractive island in Greece. Spectacular views, stunning room with staff who couldn't do more for you! Alexis was the perfect host going the extra mile to ensure we had a fantastic holiday. Information about what to see and where to eat meant we made great use of the time in Syros. Also Antonella served the most delicious breakfast on our private terrace with spectacular views. Thank you both! Not a dislike but worth knowing (which we did) there are many steps so this place might not be suitable for all. The ONLY place to stay in Syros- Loved it! Alexis was AMAZING. I immediately felt comfortable with him and he was very hospitable. He helped me plan my short stay and recommended some great places to see. My room was exquisite and small touches like complimentary wine and lavender sachets under the pillow made it feel so luxury. Don't stay anywhere else in Syros. The facility is stunning, room and bathroom decorated with taste, wifi working well, amazing view on ermoupouli. A perfect bubble to escape the daily routine. Alexis is the perfect host. Toughtful,extremly efficient, suggesting the best restaurants to eat, the best places to go and organizing everything for you (booking restaurant, windsurf lessons, diving lessons, etc...) A service worth a five stars hotel in a family atmosphere ! The best ! If you come to Syros -Stay here! Amazing hotel, with the most friendly staff. It's located in Ano Syros - the old town, on the hill with breath taking views for the city of Ermoupoli, the sea, sometimes you can see the closest islands. Alexis is the perfect host. Very friendly, open, helpful,extremely efficient, suggesting the best restaurants to eat, the best places to go. Our room with the bed on rock, shower with original marble rocks was amazing. fresh breakfast served on terrace with the sea view - it's amazing Every evening Alexis makes special cocktails for the guests, and you can spend the evening enjoying the view Every day fresh flowers in room. Awesome attention to details. Excellent views and home made breakfasts. The attention to every little details was amazing and the host was the most attentive anyone could want. Fantastic - we will be back next year. Alex the host/owner of Wind Tales was absolutely charming and could not do enough for us. The breakfasts on the stunning terrace overlooking the town below were among the best we've ever had. Homemade jam from Alex's family farm. Freshly squeezed juices. Our accommodation was charming. The old town a wonder to explore. The restaurants Alex recommended were excellent. Syros was full of surprises and we cannot wait to go back. Everything. Alexis was nice enough to welcome us at the port. The place is in a little cute town with nice shops. The rooms feel like home, with personal details added with authentic cultural items to complement the 1200's room rocks. And the breakfast was the cherry on the top with a beautiful view and good food. Love the place. Our host Alexis was wonderful as well as his assistant that served us breakfast everyday. Very relaxing and in a very interesting location. FEELING AT HOME AWAY FROM HOME!!!! A WONDERFUL host (Alexis)! He was able to arrange almost everything (even a rental car!) and offered -together with his great team- a felling of warm hospitality and personality. The room represented the TYPICAL local style of the Cyclades and the "sundowner" with a phantastic view over Hermopolis is worth to remember. A wonderful breakfast with HOMMADE juices and differnt kind of jam was a wonderful start into the day. Even the "difficult" transport of the suitcase via the small stairs of Ano Syros was arranged by Alexis. He stood at the port after arrival of the ferry and right fom the beginning we had the feeling of beeing not clients but "friends". WE HIGHLY RECOMMEND THIS INDIVIDUAL GUESTHOUSE!!!! Many thanks for this awsome experience!!!! One of the best places we have ever visited. Beautifully decorated bedrooms, incredible views, homemade breakfast, honest smiles. And quiet! You can hear the sounds of Syros. Alexis pays attention to the smallest details and everyone is always there when you need them. We chose the Relax room, and we left this place totally relaxed! We slept like babies! Will come again very soon! Thank you for everything! The view is stunning and the room really nice, specially the bathroom. Alexis, the owner, made us feel very welcome. The wonderful breakfast is served on the terrace: fresh juice, eggs, coffee, homemade marmelade, bread, feta, yogurt, honey, fresh fruit...Wind Tales is located in Ano Syros, a charming medieval village. Alexis was a brilliant host, so friendly and informative. Him and Dmitri even picked us up from the other side of the island, going that extra mile. They also dropped us off at the port at 6.30am on departure and bought us breakfast in the port as we didn't have time to eat at Wind Tales before. On that note - the breakfast is incredible! All fresh and amazing ingredients served by a lovely woman (whose name I've forgotten now). The location is a bit of a hidden gem compared to many of the very touristy islands - Anos Syros is a beautiful little town overlooking Hermopoulis which comes to life at night with restaurants and shops opening in the narrow alleyways at night, creating a great little atmosphere. You can walk down to Hermopoulis easily in the day or it's a 5 minute taxi. The room itself was lovely, the bedroom being a really nicely done up place. The bathroom was amazing - stone bath and exposed beams everywhere. Each night we had a top up of local wine and limoncello. Outside of the room and downstairs was a shared area which was really homely and had plenty of books you could read. Just outside from there is the lovely veranda with lots of comfy seats and cushions (though a little windy - the clue is in the name!) I'm waffling a little bit, but my girlfriend and I really couldn't praise Wind Tales enough! το πρωινο ηταν απιστευτο και το δωματιο τελειο!!!! Εξαιρετική τοποθεσία 2 λεπτά από το κέντρο της Άνω Σύρου, πολύ άνετο δωμάτιο καλόγουστα διακοσμημένο με όλες τις απαραίτητες παροχές ενός πολυτελούς ξενώνα. Υπέροχη θέα στην Ερμούπολη από τον κήπο του! Εύγευστο σπιτικό πρωινό με τοπικά προϊόντα (ζητήστε οπωσδήποτε μαρμελάδα μανταρίνι και χυμό λεμόνι)! Ο ιδιοκτήτης και το προσωπικό πολύ ευγενικοί και δίπλα σας σε ότι χρειαστείτε. Δωρεάν wifi σε όλους τους χώρους! Θα μείνετε απόλυτα ευχαριστημένοι από την διαμονή σας! Μοναδική τοποθεσία με θέα τη θάλασσα! Το δωμάτιο μου ήταν πεντακάθαρο και αυτό που μου έκανε ιδιαίτερη εντύπωση ήταν πως μπαίνοντας μύριζε θυμάρι & λεβάντα! Ο ιδιοκτήτης εξυπηρετικός και ευγενέστατος! Ανυπομονώ να επιστρέψω για περισσότερες ημέρες! και αν διαβασαμε μολις το δοκιμασαμε καταλαβαμε!! συγχαρητηρια!! Παραδοσιακό και διαφορετικό! Διακοσμηση και άποψη !! Πολύ καλή εξυπηρετηση,πολύ προσεγμένο κατάλυμα με πολύ ωραία θέα,ωραιο πρωινό. Τρομερή τοποθεσία, υπέροχη θέα, βιώνεις πραγματικά το συναίσθημα του νησιού, εξαιρετικοί άνθρωποι!